Your survival in the outdoors may depend on you mastering these parameters for treating cold weather injuries. ReadyNutrition Readers, this installment on our Winter First Aid preparation will cover first aid procedures to follow, as well as different types of cold weather injuries. We will be listing them and glancing over them, as we will be covering each injury in depth in future installments. The previous article covered some equipment that will be essential in the coming months when the temperature renders first aid more difficult. You can master these complexities by being properly prepared and when you are aware of the dangers you face during the winter months. Hypothermia (injury by heat loss) is one of the most obvious drawbacks in the winter, but there is one that should bear mention before it: dehydration. Yes, something you would normally associate with the summer months also comes to bear in the winter. Why? It is because people drink less water in a cold weather environment. In addition to this, your body requires a larger volume of water than normal due to the calories spent in physical activity and the amount of stress your body suffers to keep it warm. Your key indicator is thirst, and this is a late sign of dehydration. When you are thirsty, your body has gone beyond the point where it needed water. Such is why you must have canteens that can deliver, and just as important: you must use them. If normal requirements are a gallon a day per person, you need roughly 25% more, or 1 gallon + 1 quart to maintain yourself in a cold weather/winter environment. Another sign of dehydration is the color of your urine. The darker the color, the more dehydrated you are. Now, there is another phase that you need to be aware of with the human body, and that phase is indicated by urine that is dark, the color of pancake syrup. This condition is called acute myoglobinuria, and it is an indicator that you are in serious trouble and about to go into renal failure. Usually this condition arises as a result of trauma, especially burns, however, it can also be from severe dehydration. Always treat for shock: As we mentioned in the previously-posted article, shock is the killer and must be treated as one that can strike insidiously over time or suddenly without warning. ABC’s: Airway, Breathing, and Circulation. Ensure the patient has a clear, unobstructed airway, and that he or she is breathing. Next check for a pulse and if one is not found, immediately initiate CPR procedures. The “C” also means check for circulation with regard to bleeding. Shelter: for both you and your patient; this must be found prior to nightfall, and includes preparations for a fire, as the nighttime temperature will decrease significantly. Gather enough wood as will be needed and remember you must keep the supply continuous. Signal: either by cell phone, radio, or visual signaling device if you and your patient are unable to leave the immediate vicinity where the injury has occurred. Security: from all things – animals, people, weather; you must protect yourself and your patient at all times and do not allow further harm to come to him or her. You must constantly be on the alert for threats that also take the form of changing and worsening conditions that could hurt the both of you. 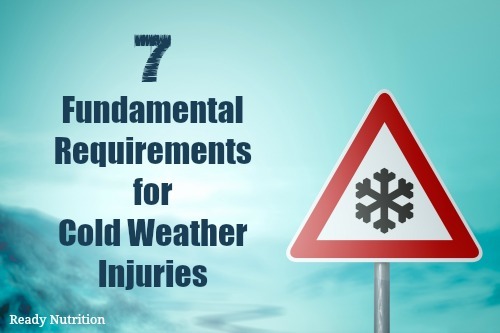 These are your basic parameters to follow for cold weather injuries. We will be covering the list (as well as other scenarios) and utilizing the skills necessary for each different problem encountered. Remember to prepare beforehand: know the area you are going to be in. Where are the nearest Ranger stations? Where is the nearest hospital? It may be the difference between life and death to know how to raise one of these on a Ham radio station. Knowing the way to get out of an area is just as important as knowing how to go in.